My point was proven again two days ago when I was led by my husband to another abundant foraging spot, which I have named 'mulberry alley'. Perhaps mulberries are easy to find, but not everyone knows what they are. They are worth taking the time to learn about, and even if they take little effort to find, I now place them high on my list of valuable foragables. 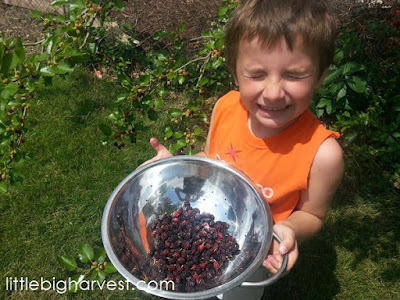 I first wrote about mulberries two years ago in this post, in which I waxed a bit poetic. I tend to fall in love with the underdog. In the case of the mulberry, I argue that it's a gem that has fallen out of favor a bit in the modern world, but one that we should all harvest if given the opportunity. The mulberry, with its tendency to spread and thrive, is often considered a weed. Urban or rural, mulberry trees can survive and multiply in places where nothing else will. In an urban setting, they are found most often along fences, in neglected lots or side yards and areas that don't get mowed often. When young, a mulberry can grow up to 10 feet in a single year, often in clumps with several other saplings. If given enough time and space, the mulberry will transform from a scrubby brush into a majestic tree, up to 50 feet tall, bearing fruit for many years. Before I could readily identify the mulberry by its leaves, I didn't realize that the 'weed' pictured below in my side garden is indeed a hardy group of mulberries, coming back resolutely every year from between two big slabs of concrete. Every year I cut them down to stubs, sometimes even pouring boiling water over them, and yet they continue to return, as hardy as ever. Though I can't let this little rowdy band of mulberries mature into trees in this location, they've made me realize just how hardy this plant is. are actually a little gang of mulberries. Unfortunately I can't let them grow here! Those who have mulberries growing on their property sometimes consider them a nuisance, especially if the tree has grown to epic proportions. The berries can create quite a mess. Not only do they drip like rain over whatever is underneath, and then stain the road or driveway, but they are also eaten voraciously by birds who then drop lots of brightly colored poo, staining just as badly as the berries themselves. Those mulberry stains? They wash away by summer's end. But the harvest you can glean from the tree will last all the way through until the next season. I'm here to make the case for the mulberry, not just as a weed, but as a wild fruit we can enjoy with little effort, just about anywhere. I've never seen a white mulberry tree, though they have invaded much of North America. plant identifier and forager--she found it near her property. There are many species of mulberries, and hundreds of varieties that have been cultivated and hybridized. The most common wildly growing mulberry trees in North America are red and white. Red mulberry is native to North America, while white mulberry is an invasive species introduced from Asia during colonial times. Other well-known varieties; the black mulberry, native to West Asia, and this interesting variety cultivated in Pakistan, which has dramatic elongated berries. Here is another cultivated mulberry with long fruits. 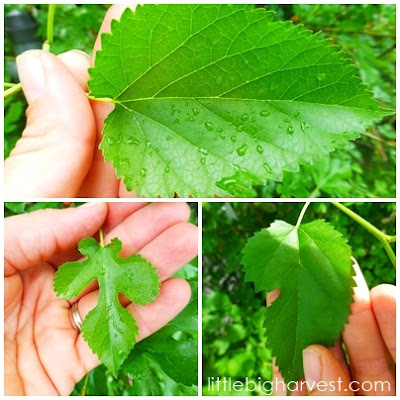 All mulberry trees species exhibit the distinct leaf shapes pictured below. The mature trees will usually have symmetrical edges without lobes, while young trees tend to have leaves with various patterns of lobes. The top leaf has no lobes, only uniform edges. They are found mostly on mature trees. The berries of the red mulberry are also very distinct. Some people mistake the mature, dark fruit for blackberries. However, on the tree, the berries ripen gradually and you'll usually see several shades of berries, ranging from white to pink to dark red, almost black. When ripe, the berries barely cling to the branches. The slightest breeze or bump will knock the ripest fruits off and send them showering down. This makes it easy to harvest them. I like to hold a large bowl or colander under the branches and 'tickle' the branch gently. Working my way down a branch, I can get all the ripest berries while barely touching them, just letting them fall into my bowl. Even easier is this traditional method; lay a tarp or sheet under the branches and give the tree a few shakes. The ripe berries will yield from the branches and fall, filling your sheet, which you can then gather up by the corners and carry inside. First and foremost, eat them raw! I think they are best raw, directly from the tree--a fleeting seasonal treat to look forward to. Freeze them. Take out of the freezer all year long to use in smoothies, pancakes, oatmeal, etc. Dry the leaves and berries for tea. The berries lose virtually all flavor when dried, but will keep their nutritional qualities and can be used with the leaves in a tea. Make jam. One of my favorite tastes of summer is the subtle sweetness of mulberry jam (I love this recipe). Ferment them. You can either make wine, make a simple syrup and use in water kefir, or ferment the berries themselves under a layer of honey. Another method: make mulberry juice (below) and add a teaspoon of whey or kraut juice and allow to ferment into a delicious soda. Make juice. Gently simmer one cup berries in two cups water for 20 minutes, strain and sweeten with sugar or honey. This is my youngest son's current favorite way to use mulberries. Scroll to the bottom of this link for an interesting variation, Mulberry Iced Tea. 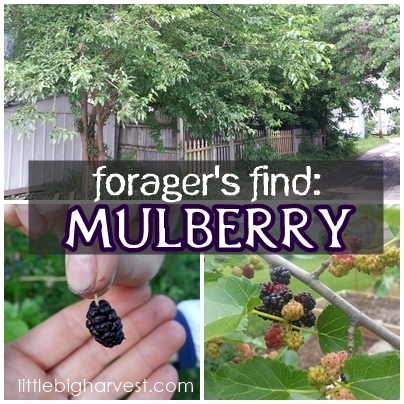 Since they are so easy to find, mulberries are a great foraged fruit for beginners. They are a tasty and luscious berry that may enhance your health and your appreciation of nature's abundance. They also can be considered useful for another purpose; healing the land we've so long abused. In Paradise Lot: Two Plant Geeks, One-Tenth of an Acre , Eric Toensmeier discusses the impossible hardiness of the mulberry and how it survives in our cities despite the way we've displaced or destroyed so many native species with our asphalt and manicured lawns. 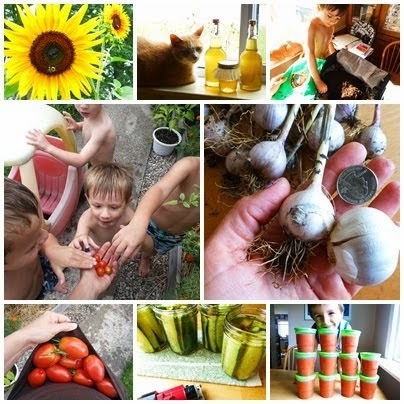 "The more I learn about ecology and permaculture, the more I have come to appreciate what dense tangles of tree-of-heaven, mulberry, sumac, and goldenrod are doing; healing cities from the damage we have done to them. Spontaneous urban vegetation that is able to survive extensive paving, drainage problems, compacted soils, heavy use of road salt, contamination of air and soil"...these "plants have adapted to the abuse, and thrive, and we are constantly weeding them out." Find a tenacious mulberry tree that has not been weeded out, and enjoy its simple gifts! This is awesome information! 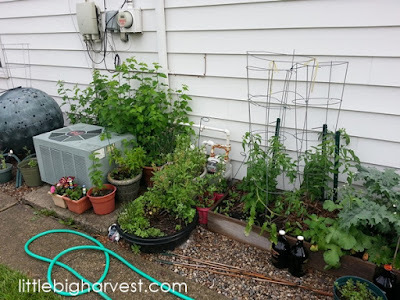 I am looking for plants that are extremely hardy and edible! I will have to see if I can forage for some... though I can't say I've seen them in any nearby forest. I'd love to plant this all around the edge of my yard. I am on a corner lot that's 4 acres. I am trying to fill in the edges with various trees and shrubs. This would be perfect! Wow, now I'm going to have to start looking for mulberries when I go walking next. I just looked it up, and apparently the White Mulberry is the common one up her in British Columbia, Canada so I'll be looking for the white variety (although I might come across the red too). Looking forward to finding my first bush. Great post, Andrea. Funny to read this now, as my husband just returned from a business trip in the midwest, where he said mulberry trees were everywhere. They're not very common here in the northeast, but do grow well here. 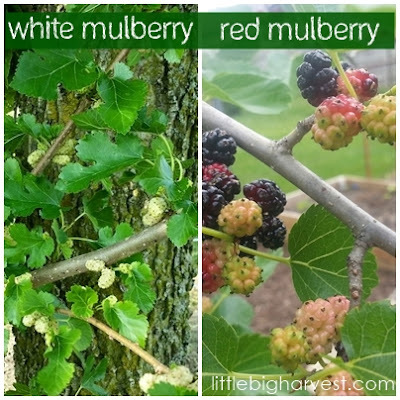 About 20 years ago when I was planning our wildlife friendly foodscape, red mulberry was at the top of my list, but I could not find a tree to buy anywhere. At that time red mulberry was much maligned around here, because they are "messy" and stain sidewalks. So I could not include it in our yard. But now that food scaping and native plantings are so popular, red mulberry is widely available. Fashion changes! We are going to make room for a few of them this fall, and plant them next spring. You are lucky to have them in abundance in the wild. I made pie out of mulberries a couple years back. It was by far the nicest berry pie I've ever had.